‪HRAX‬ aka Hebden Royd Alternative Christmas - 25th June 2016 in Hebden Bridge and Mytholmroyd. All welcome, residents and visitors alike. After the devastation caused by the Boxing Day floods tearing through the towns of the Upper Calder Valley, it was suggested that it would be worth "re-running" Christmas Day six months later. This was met with great local support and we now have well over 1900 people in this group! There have also been interviews on BBC Leeds and the Pulse about it. Mytholmroyd Gala will be on that day and provide a family oriented hub with a fair ground, stalls for community organisations and a wide range of live music and other cabaret entertainment in its usual site on the school playing fields next to Burnley Road. They will also have one of two large potted Christmas trees providing a focal point for a choir and brass band to perform/lead carols. Calder Holmes Park in Hebden Bridge will host the Fair For Youth aimed at young people. They will have a variety of events, both to participate in as well as to watch, including live music, a hands-on arts and crafts tent as well as a range of sports and other activities. Holme Street will be closed for a street party organised by the world famous Trades Club, with DJs, kids activities, bands and a bar. Riverside School will host the previously mentioned Christmas Lunch for approximately 500 volunteers. The film, "Elf" will be shown at the Hebden Bridge Picture House as a free admission treat for the towns folk and visitors alike. The Picture House has suffered from much lower than normal footfall since reopening after the flooding so, as well as being a nice gesture to the town, it would get people from further afield through the doors. St Georges Square in Hebden Bridge will have a 15ft potted Christmas tree, courtesy of Hebden Royd Town Council, around which the Hebden Bridge Junior Brass Band playing and various choirs will be carol singing. This will also be replicated in Mytholmroyd. These trees will then be replanted as a small part of the flood alleviation efforts. There will be various performances of Christmas themed street theatre roaming around in all locations, including Mytholmroyd. There will be six small artificial snow machines in various locations, courtesy of Thingumajig Theatre. Amy Harbour (ex HB Town Hall) is organising Festive Fandango rewards, vouchers and hamper for the business community. A Christmas Market in Hebden Bridge in Lees Yard with priority given to crafts and handmade items, and to traders, firstly from Hebden Royd, then from the borough of Calderdale, organised by the Calderdale Markets Team. The Town Hall terrace will be the venue for C I Adventures who will have a small climbing wall and maybe even a little cave for 8-16 year olds. The motorcycle club and 4x4 club who kept a protecting eye on the valley throughout the immediate aftermath of the flooding will perform a drive-through of Hebden Bridge and Mytholmroyd. The business community will be having various offers and promotions to coincide with the day and many local pubs and other businesses will be doing their own thing. For example, the White Swan will be hosting an Aussie-Christmas-themed barbecue. There will be two first aid posts, staffed by St John's Ambulance. One in the town and one in Calder Holmes Park. If that wasn't enough, it is also the first day of the Hebden Bridge Arts Festival, so there are all sorts of other events happening. See www.hbaf.co.uk for more information about these. The Pulse have asked if they can do an outside broadcast as have the local TV. Two separate TV production companies are in contact regarding filming during the day and before. 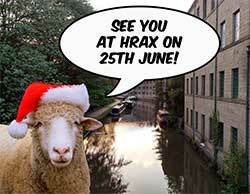 Can you give up 2 hours to help as a volunteer steward during #HRAX? We want you to have fun on the day doing other stuff too, so we're only looking for micro-shifts! If you can, and you want to help, please email Hazel Draper so she can put you on the rota. Thank you!